A former Green Award winner himself, Don Myers of Pringle Park Community knows a thing or two about sustainability. 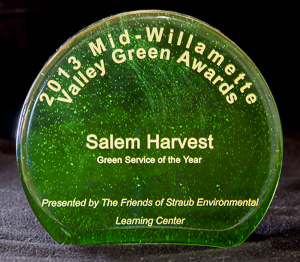 Myers was among the guests at the Salem Conference Center for the 2013 Mid-Valley Green Awards. About 300 guests turned out for dinner, auctions and to lend support to sustainable practices. The county and Capital Subaru are among the entities that help put on the event, which is hosted by Friends of Straub Learning Center. During the gala eight businesses or individuals around the community were honored with awards for their efforts in sustainability, including a new award this year “Sustainable Service of the Year.” In addition, John Miller, founder of Wildwood Mahonia, received lifetime achievement recognition. Myers-Shenai’s counterpart, Alan Pennington, Marion County’s waste reduction coordinator, said the new service award was created because in previous years there were nominees that deserved recognition but really didn’t fit into one of the other categories. The new category had seven nominees. Pennington pointed to Salem Harvest and Green Bike Cab as examples. Salem Harvest is the largest community harvesting organization in Oregon — connecting farmers and backyard growers with volunteer pickers to harvest fruits and vegetables that would otherwise go to waste. In the three years of its existence, the nonprofit’s thousands of volunteers picked over 300,000 pounds of food, half of which was donated to the Marion-Polk Food Share or its affiliated food pantries, helping to combat hunger in this region. The all-volunteer organization has very low overhead costs and can harvest food for less than 5 cents a pound in organizational costs. The nonprofit also serves to teach volunteers about where their food comes from, and brings together a broad cross-section of the community: both individuals interested in sustainable lifestyles as well as those struggling with economic challenges. Ellen Stevens, a longtime volunteer at the Assistance League of Salem-Keizer, is the guru of recycling as well as the impetus behind the League’s reduce/reuse/recycle efforts. Her efforts include working to create a zero waste Cook’s Tour; setting up regular recycling at each of the League’s three main shops; finding creative ways to recycle or reuse the hundreds of plastic bags, cardboard boxes, hangers and old clothing taken at the shops; and guiding the renovation of Encore Furniture to include green building practices. She has also instituted a training program to teach the League’s reduce/reuse/recycle practices to each year’s new member class—quite the challenge in an organization of more than 400 volunteers. Marie Carver teaches integrated science, conservation biology, gardening and art in nature at the Jane Goodall Environmental Middle School. She has a very “hands-on” approach to teaching: her students, partnered with local governments or nonprofits, conduct research on a number of local environmental issues, including amphibian decline, stream health, pika survival and recolonization after a forest fire. Carver also offers her students opportunities to work on gardening projects around Salem. to teach them the importance of caring for their local environment. And her art class focuses on environmental art by combining students’ experiences on field trips with artistic, creative representation. Compex Two, which provides medical and professional grade technology, has a comprehensive recycling program at its building, green purchasing for its paper and other products and an electric car for travel. But it’s in the technology solutions that the company has shown its true green color: for example, it has a unique partnership with local schools to take in old computers from Compex Two’s clients for students to dissect and learn how computers work; and it has implemented Cloud computing solutions to reduce independent energy consumption; and the company encourages clients to purchase Energy Star-certified monitors. Compex Two offers ongoing environmental trainings to employees. and regularly holds green team meetings, as well as spreads the word to the community through events, such as Earth Day at the Oregon Garden. There, Compex Two held an electric car driving activity for children that led recyclers from the ‘recycle bins’ to the ‘recycle center’ in electric radio controlled cars. Besides all of their recycling efforts, Compex Two, understands that a sustainable business is one whose employees model green behavior. The company issues a pair of running shoes to each employee to encourage walking to appointments and the company bike is available for travel farther away. SAIF Corp. has reduced paper usage by 6 million pages a year by moving to electronic records and double-sided copies; reduced electricity and natural gas use by more than 5 percent, and saved approximately $25,000 in energy bills; and in the last three years, reduced its fleet of vehicles by 20, resulting in a 4 percent reduction in miles driven, gallons used and emissions emitted between 2010 and 2011. The purchase of a refurbished compactor for mixed recycling cut SAIF’s waste hauling fees by about $10,000 a year. SAIF also replaced most of the landscaping with native plants that require little irrigation—eco-turf scheduled to be installed this year should reduce water use in the courtyard by 75 percent. In addition, SAIF has made tremendous efforts in educating its employees—recycling stations take different hard-to-recycle items each month, employees are rewarded for turning all energy-using devices off each night, reusable drink cups are sold in the café, and events throughout the year allow employees to exchange household items such as books. Willamette Valley Fruit Company’s efforts to go green go far beyond the 400,000 gallons of water applied to farm land each year after all of the company’s fruit is washed. The processing plant recycled enough cardboard since 2005 to save the company more than $58,000 and installed energy efficient lights to save more than 45,000 kilowatt hours per year; and replaced old doors with high-speed roll-up doors on the cooler to save more than $12,000 a year in energy costs. Future projects include the purchase of an energy-efficient air compressor system that will save about 70,000 kilowatt-hours per year and $5,553 annually in energy costs, and another set of high-speed roll-up doors on a new cooler which will save $7,000 annually in energy costs.